When I look at your beautiful b&w photos and read your words I feel like I'm deep in a forest in Northern California. 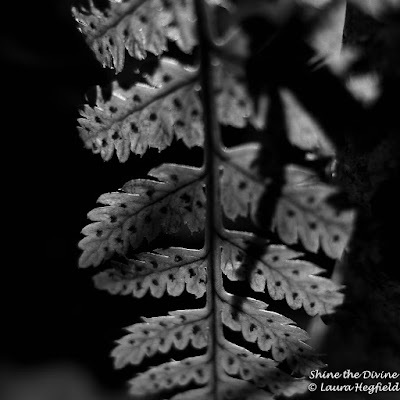 Slivers of sun spike through the trees, lighting the ferns momentarily. Thinking of you often, praying too. I am so happy you are in the realm of friends. You are a blessing, dearest heart, kindred. Amazing how few words say so much... they are the image the image is them. Intriguing photo and haiku. Well done. Excellent choice for black and white. I'm loving the mystery of your secret shadows! You look at nature's simple wonder, a leaf, and are inspired to capture its beauty. Beautiful photos and such a lovely haiku. Have a great weekend dear Laura! This is so elegant, a wonderful monochrome! I don't know if you know I have another blog (actually 6 hehe) but one I think you might like to read? Everything is so perfectly patterned and formed on this leaf, amazing! It looks like a work of art. These are just beautiful Laura! The darkness can also be sustenance...if we know where to nibble. Wonderful B & W, I love those beautiful leaves of exquisite light. Good photos. Greetings. Wow,- these are beautiful in black and white! Love the light! Beautiful macro shots of the fern. Hi Laura that photo is fantastic. Love it! Happy Weekend! I love how you captured the light in these shots. Aren't ferns just great? YOur postis like a fairytale today! Love it! What marvelous closeups of the fern! Lovely shots! LOvely light and I love the detail on the leaves. Have a great weekend! God- the Master sure can create--and you sure can capture it!!! Most perfect lacy shadow! And perfect haiku that it so well illustrates. Enjoy your site so much. Such a wonder that this lacy beauty graces the innermost shadows. Love the textures combined with the shadows, well done. These are so lovely. They bring a delicate light into the shadows. Such an interesting post, I could look at these shots forever! The ferns seem so artistic and exotic in these stunning monochromes! Amazing photos. 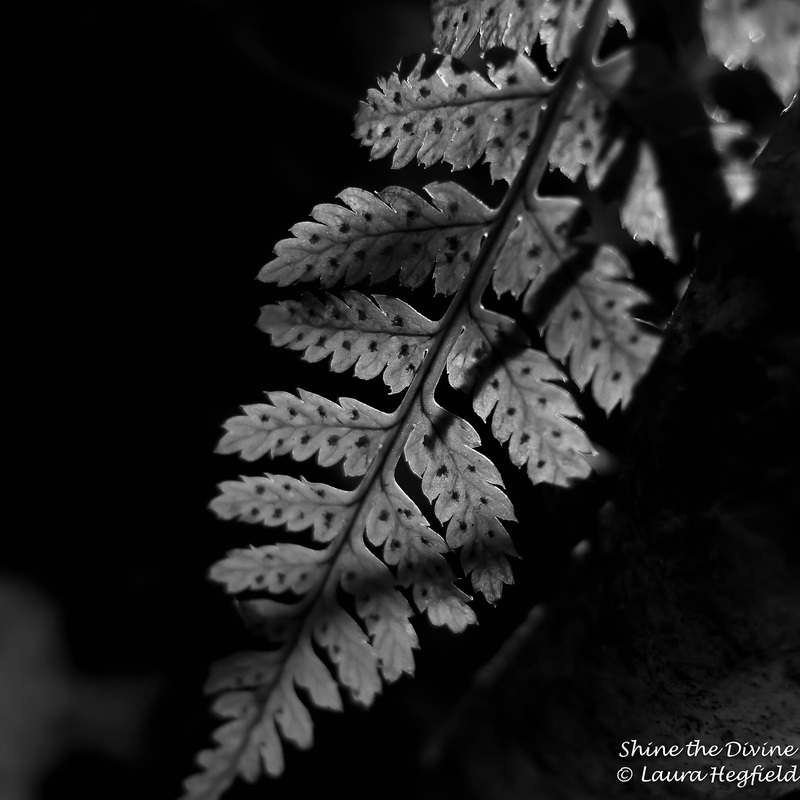 Delicate ferns ad soft shadows, truly amazing! Black and white photographs are so different from color, beautiful work. it is so magical and delicate. Beautiful photos. I've also saw a few other photos on your blog - they are very nice. I will surely return to your blog again. I am deep in my woods. What mysteriously gorgeous images. Love the lines and shadows here. These photos are so simple yet so beautiful. I love the haiku that enriches them even more. i really like these black and white shots. Beautiful light and shadows, and use of B&W! Laura, thank you for stopping by at Polonica: Home Again. I like the way you look at the world. Those ferns look like bird feathers. Beautiful. As I couldn't comment on your last post I'd love to tell you that the wonderful photography & words are breathtakinly beautiful!!!!!!!! Beautiful post and picture! I like it very much in b/w.